1 x Fixture and fittings. 1 x Boxing Glove (Mini) Key ring. 2x Boxing Gloves(Mini) Car Hanger. 2x Hand Gripper. 1 x G-Core twinned layer non tear filled Punch bag 5ft (It’s waterproof & can be used outside). • Machine filled punch bag. Zero Impact G-Core twinned layer, non-tear, Maya Hide Leathered punching bag is built to endure the rigors of the toughest gyms. 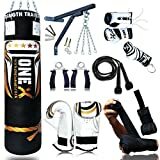 Perfect for Muay-Thai kickboxing, boxing and MMA, the bag kit includes everything you need to practice your technique and enhance stamina, increase power and strength. The bag holds 20-24 KG (5ft) approximately. Filled option with shredded textiles offer astute shock absorption, protecting wrists and hands while returning to its original shape quickly. Heavy gauge welded D-rings are double stitched and riveted to the bag for extra sturdiness. Heavy duty zip-fastened top closure ensures maximum fill potential. The tethered loop facility at the base of the punch bag ensures maximum swing reduction when used with tethered straps.